Research just published in the journal Plos Genetics has found that gaining new genes during evolution is a much more frequent event than previously thought. It has been seen that there are hundreds of genes that might be unique to humans, and something similar occurs in chimpanzees. Some of these genes will be useful for the organism in question and the rest will disappear in time. The work was led by Mar Albà, an ICREA researcher at the Mar Institute of Medical Research (IMIM) and Jorge Ruiz-Orera, from the same group, together with researchers from Pompeu Fabra University (UPF) and the Centre for Genomic Regulation (CRG). For some time it was thought that all new genes originated from other genes, for example, from duplications of already existing genes. But recently it has been seen that some, the so-called de novo genes, originate in genomic regions that previously contained none. According to Mar Albà “This work shows that the formation of DNA motifs, through the accumulation of random mutations, would have been a determining factor in the emergence of new genes.” DNA motifs are elements that activate gene expression. In order to understand this new-gene forming process, the researchers first identified hundreds of genes specific to humans and chimps. They then compared these with the corresponding genome sequences of macaques and discovered that the new genes were enriched in DNA motifs, a necessary step in their formation. In addition, the study identified 21 previously unknown human proteins. The formation of genes with completely new functions was a total mystery until recently. This work strongly supports the hypothesis that genes are continually originated de novo. “The study shows that the generation of new genes is a continuous process, allowing organisms to acquire new functions during their evolution”, concludes the researcher. 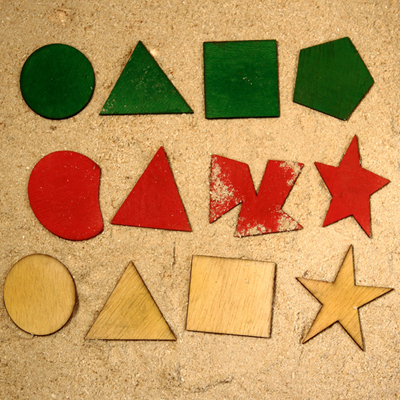 In this image the wooden pieces represent genes. We can see that the pieces are different colours, each representing the genes of a different species. We can also see that some forms resemble each other, for example, the triangle is found in all three species; it represents a gene created long ago that has been conserved. But occasionally entirely new forms appear that we can see in only one species, like the strangely-shaped piece in the middle row. These are de novo genes, formed through random mutations. The image was created by Will Blevins and José Luis Villanueva, researchers from the Evolutionary Genomics Group at the GRIB (IMIM-UPF).